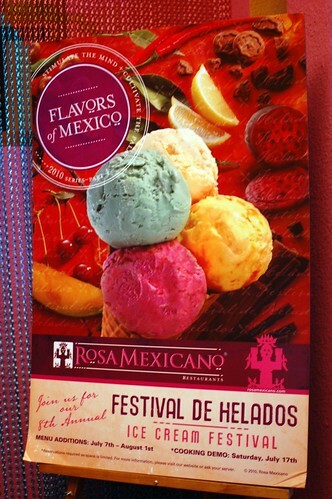 Through August 1, you can chill out at Rosa Mexicano's Festival de Helados! The Festival features 10 new flavors. I was lucky enough to sample nine of them last night at a comped media tasting. 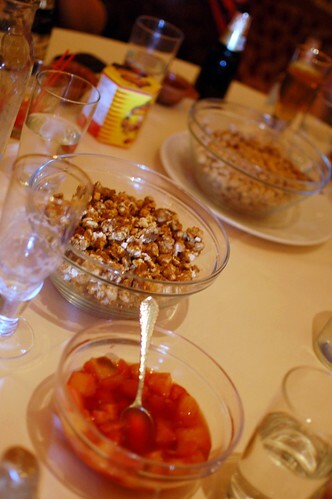 Along with the helados, we had various snacks and toppings, including fruit, caramel corn, sweet peanuts, and strawberry crisps. 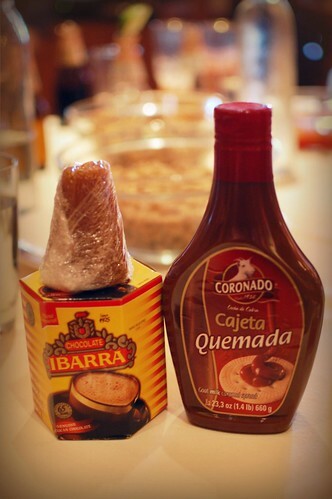 Some of the ingredients in the helados were also on the table for us to admire -- a big block of sugar, Mexican chocolate, and cajeta (goat's milk caramel). Along with the helados, we were given beer. For several of the helados, we made our own beer floats. Neat! 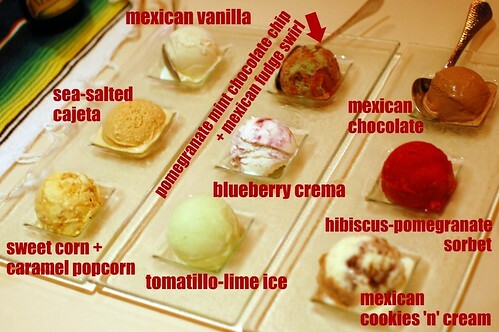 Here is my ugly guide to all the helados. I scream, you scream, we all scream for helados! One thing I learned last night -- it's hard to photograph ice cream in the dark. My favorites were the sea-salted cajeta (so rich and goat milky), sweet corn and caramel popcorn (I'm a sucker for anything with corn in it), and blueberry crema (tasted like cheesecake). 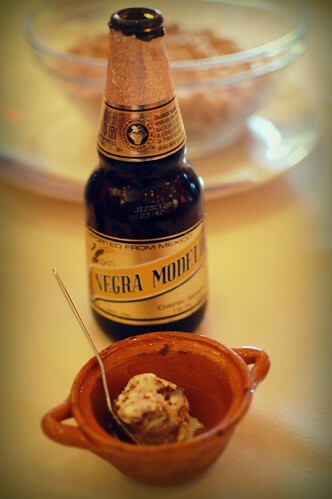 I thought the Mexican cookies 'n' cream and a dark beer yielded the best beer float. The only flavor that didn't win me over was the pomegranate mint chocolate chip and Mexican fudge swirl -- waaaaay too much going on in that scoop. This was a rather polarizing ice cream. People loved it or hated it. Or maybe only I hated it. Ha! 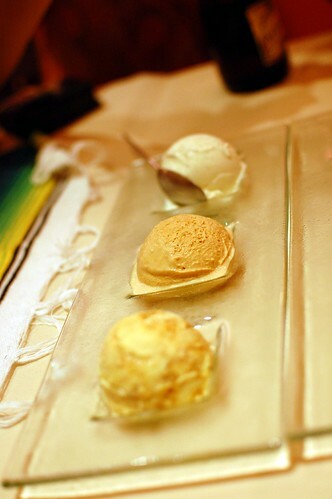 The helados were truly top-notch -- Rosa Mexicano recipes executed by the fabulous Fosselman's and the magnificent Milk. Special thanks to Vanessa and Chef England for being such wonderful hosts. 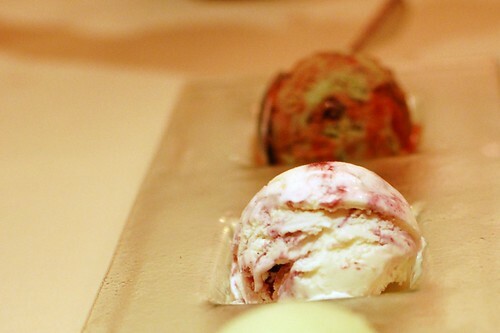 If you love ice cream, you should check out this event before it melts away! I'm soooo jealous. I was invited to this event, too, but I already had dinner plans. 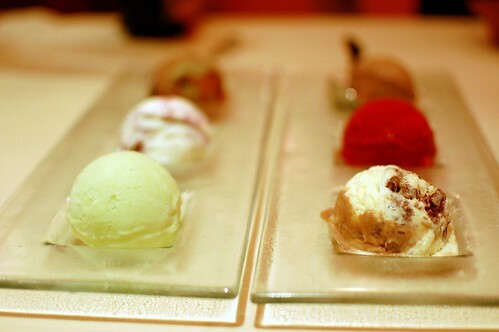 Those ice creams looked amazing. 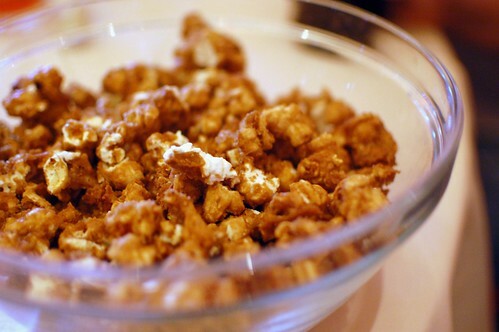 I think I would have gone for sweet corn and caramel popcorn ice cream first. 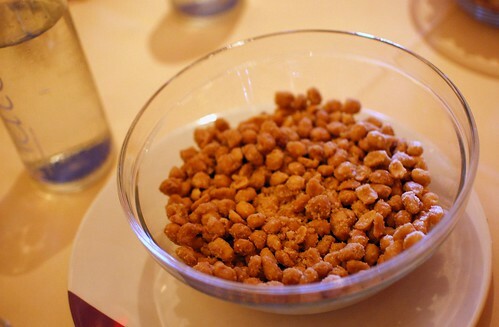 :) At least, I got to enjoy them vicariously through you. That pomegranite hibiscus looks awesome for hot summer days. the tomatillo ice looks/sounds yummy! dude. 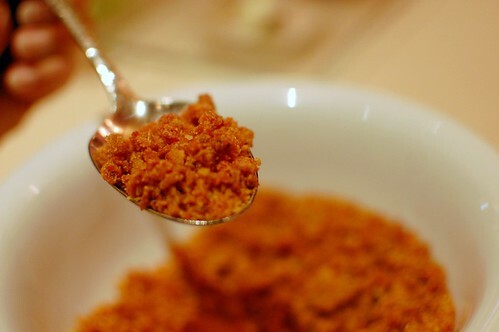 this sounds so good. Just sayin'. PS, I'm gonna make creme fraiche ice cream this summer. And you're gonna eat it. I am so jealous! I lurve Rosa Mexicano and used to work close to one. Too bad I never noticed the ice cream, but the margaritas and the guacamole were always good. Ice cream is one of the few foods that I can tolerate. It all looks so good! Dude! I love me some ice cream - this event would have been like a dream to me!